HTC reported operating losses of NT$2.2 billion, which got to NT$1.95 billion ($64.3 million) after taxes in Q2 2017. This is the ninth consecutive quarter that HTC loses money although the numbers aren’t as bad as they were in the January-March period. The overall revenue for the company in Q2 was NT$16.1 billion or about $531 million. 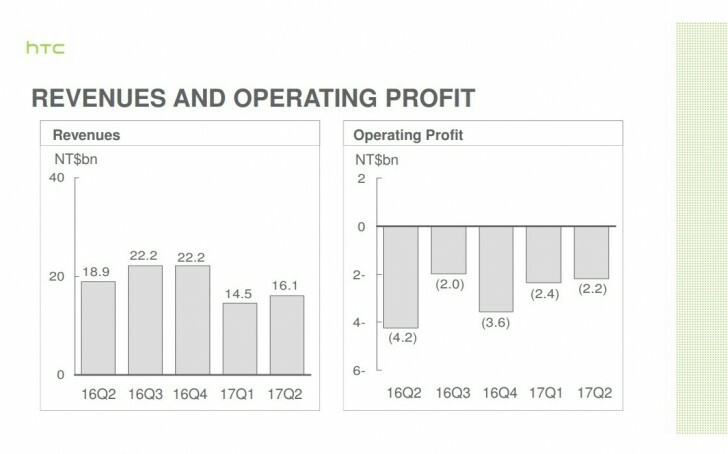 After a series of management and realignment of resources, HTC managed to cut its operating expenses down to NT$4.4 billion ($145 million) from NT$6.4 billion ($211 million) a year earlier. HTC started shipping the U11 in May and according to the company, “topped the list of Android flagship phones in Taiwan”. This led to an 11% increase in quarterly revenues. It also lowered operating loss from $2.4 billion before taxes in Q1 2017. The company expects better financial results in Q3 2017 after the launch of the VR headset HTC Standalone.